Yesterday morning we had a bit of a crisis, the grinder on our grind n’ brew coffee pot broke. The motor made a pathetic faint humming sound, but no action. After cleaning and re-seating the grind cup about a thousand times – no luck, the motor was officially roasty-toasty. Crisis, right? Sure, we have instant coffee on hand, but that just doesn’t cut it. 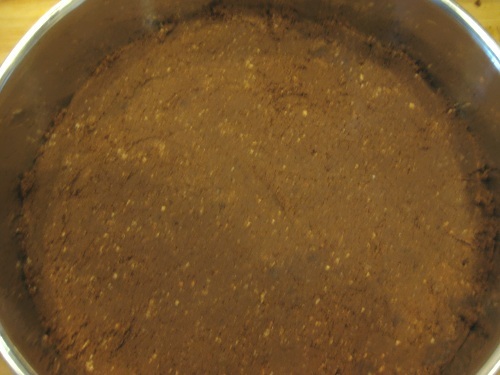 Luckily I remembered the dry container for the Vita-Mix buried in our cupboard and dug it out to grind the beans and it did an awesome job for creating a finer espresso blend making a stronger pot of coffee I think. Crisis averted and no need to run out and buy another coffee pot yet. And yesterday I actually used all three of the containers for the Vita-Mix. I decided to make Ani’s Real Cheezecake from Ani’s Raw Food Kitchen for my niece’s birthday party at my sister’s house as an adult dessert option for those not interested in cheap, neon-colored sheet cake. But this time I added an ingredient to change things up and fancy it up a bit. 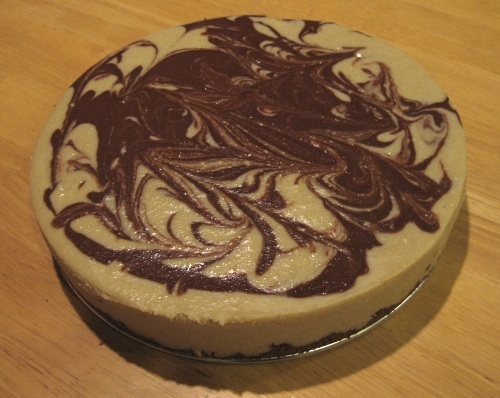 A raw instructor I know has made so many raw cheesecakes at this point that she gets all artsy with them swirling different flavors of the batter for a pretty design. 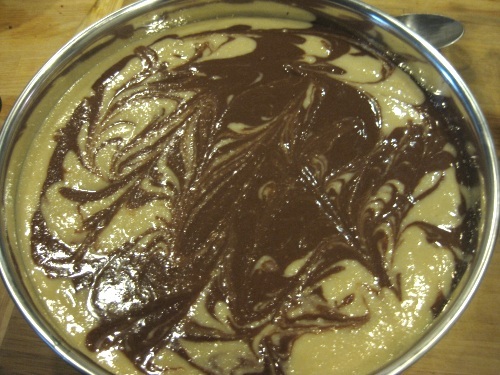 I decided to try my luck at it for this version mixing in cacao powder with half of the batter and the crust. 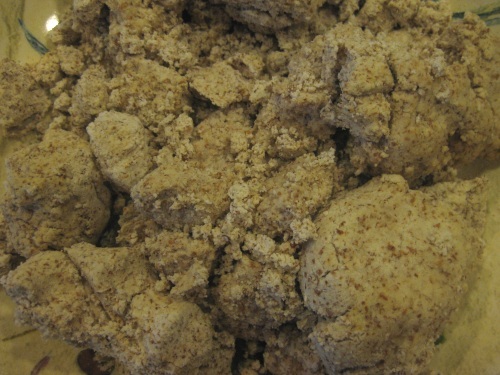 Also, in keeping with my goal to clean out the freezer and pantry this month, I defrosted almond milk pulp in the Excalibur dehydrator to use in place of macadamia nuts on the crust. Also because I didn’t have macadamia nuts and was too cheap and lazy to run out and get them in the cold rain. 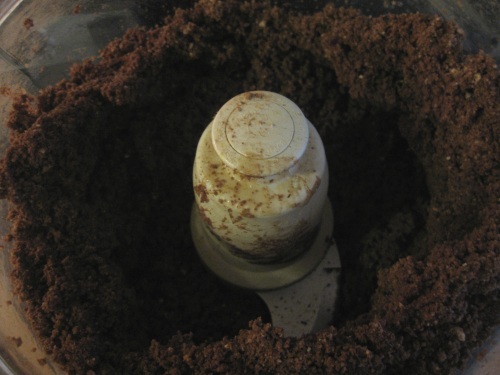 I mixed in 1/2 cup of cacao powder and the end result looked like Oreo cookie crust in the food processor. I packed the crust mixture into the bottom of an 8″ spring form cake pan and got to work on my two batter flavors using the 32 oz. and 64 oz. 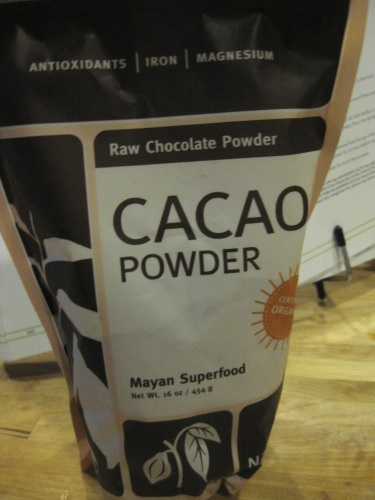 Vita-Mix containers adding 1/4 cup cacao powder to half of the batter for color and flavor. I’m glad I had two containers because that made it easy for drizzling the two together. 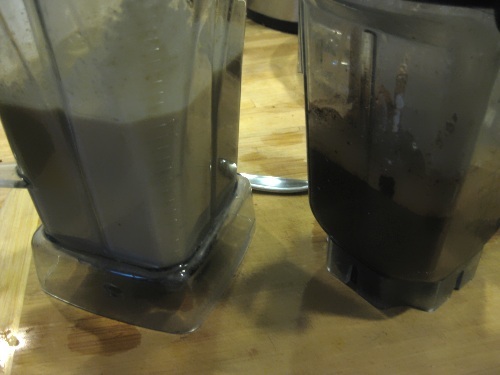 True, one container would have worked, but it would have been a time-consuming hassle pouring one batter into a pouring container, rinsing it out and preparing the second batch before pouring into the pan. And mine almost looked professional! Into the freezer it went to chill before serving later at the party. 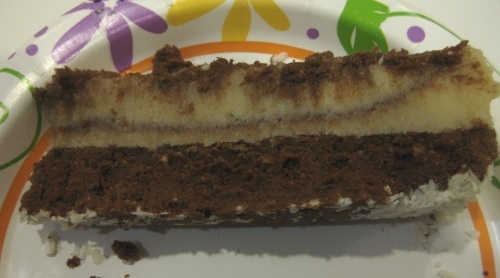 The chocolate marbling was pretty consistent throughout the cake too making for pretty slices. The crust ended up being a little thicker than I wanted, but it was more like a chocolate brownie and worked out okay. My sweet mother also picked up some vegan dishes to make sure I’d have enough to eat at the party. Most of the guests were meat-loving Italians chowing down on homemade mac n’ cheese, a rib roast, shrimp and lasagna. 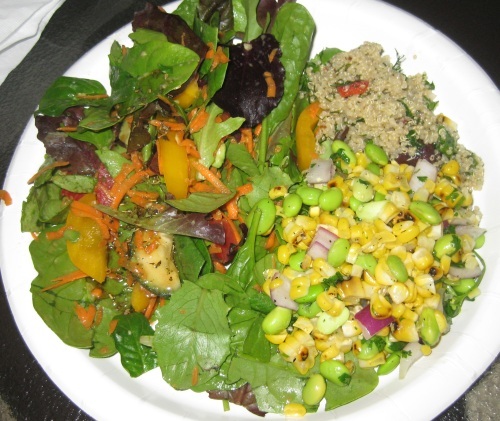 I got a beautiful salad, a corn-edamame dish and a quinoa olive dish that was wonderful. Good stuff and it was a great night of watching kids whack at a pinata, catch up with a lot of friends we haven’t seen in too long and drink … maybe a bit too much. Forgot how strong Southern Comfort could be! Two Old Fashions is too much when pour-happy family members are mixing them up! Now I remember why I usually stick to wine. Wow– that cake is BEAUTIFUL! It looks like something you’d see at a fancy raw restaurant! Or just ANY fancy restaurant, ha! My family goes nuts making drinks. So many people guzzling down Manhattans – blegh. Your cheezecake is fabulous! Great job! Cheesecake looks great! Don’t you just love how quick and easy raw desserts can be? ?